On September 25, 2015 Baja Bound (BGLC's auto insurance partner) attended a forum hosted by the Otay Mesa Chamber of Commerce. Rudolfo Figueroa, a federal delegate for the Instituto Nacional de Migración (INM or National Institute of Immigration) for the Baja region was the guest speaker. Rudolfo presented new operational changes that have been enacted for frequent visitors to maintain valid FMM immigration status. Driving: Visitors driving their vehicles across the border will not be asked to stop and complete an FMM, however the FMM is still required by law once you cross into Mexico. INM offices are generally located right at the border crossing and the current cost of an FMM is around $20 US dollars. Pedestrians: Visitors walking across the border at the El Chaparral port of entry are now required to have their passport or passport card and are asked to fill out the FMM and pay the fee if necessary. The Otay Mesa crossing will follow suit as soon as the new border facility at that location is completed. Is the requirement to get an FMM tourist card new? - No. More media attention has been focused on the FMM since INM is now requiring those who walk across the border to have a valid FMM. What happened to the tourist zone/72 hour exemption from getting an FMM tourist card? - The tourist zone/72 hour exemption was never actually part of Mexican immigration law. When I drive across the border, will I be stopped to get an FMM? - No. At this time officials are not checking for FMMs when driving across the border. 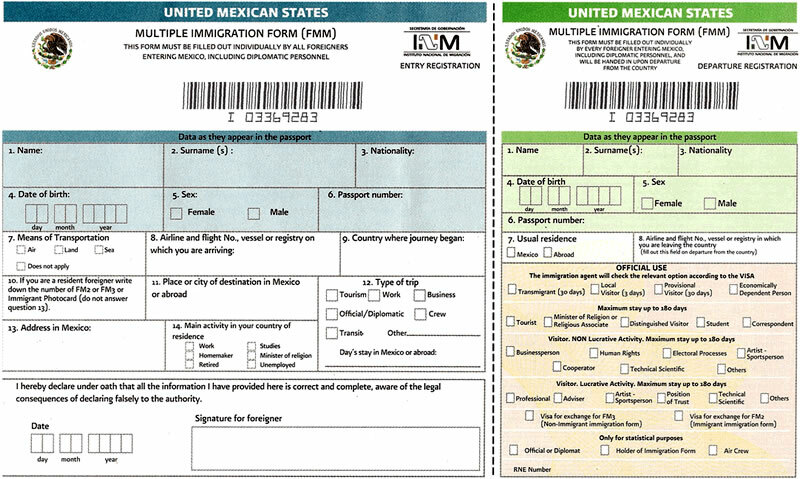 However, the FMM is still legally required once in Mexico. What document do I need to present to get an FMM? - Only a valid passport or passport card is accepted to get an FMM. Drivers licenses, enhanced drivers licenses, birth certificates and SENTRI cards are not accepted. Please visit our How to apply for a Mexican Tourist Cards/Visas (FMM) for more information about how and where to obtain your FMM. If you have any questions about immigration requirements, contact the Instituto Nacional de Migración (INM).